Hollywood Japanese Cultural Institute members sing a Japanese New Year’s song on Feb 13. The Hollywood Japanese Cultural Institute and Gakuen welcomed the Year of the Monkey with members and friends on Feb. 13. Longtime HJCI President Brian Yamasaki gave special recognition to Kazue Ogino, who recently retired as principal of the Hollywood Japanese Language School and from the HJCI Board. Ogino Sensei remains active as an advisor to HJCI and the Gakuen. President Brian Yamasaki offers welcoming remarks. Also recognized was Gary Freeman, longtime judo instructor and head sensei of the Hollywood Judo Dojo. Freeman Sensei has been active in judo since 1949 and recently earned his sixth-degree (roku dan) ranking. He started judo at Sawtelle under Takashi Kikuchi and later joined Kikuchi Sensei at the Hollywood Dojo following discharge from the Army in 1960. Freeman Sensei has led the Hollywood Dojo since the passing of head sensei and community activist Frank Emi in 2010. Emi Sensei is one of a few to have earned the rank of hachi dan (eighth degree) in judo. Current cabinet members were also introduced: President Yamasaki; Vice President Hideo Kuwahara, Treasurer Jerry Naito; Corresponding Secretary Atsuko Donley; and Recording Secretary Asao Masumiya. 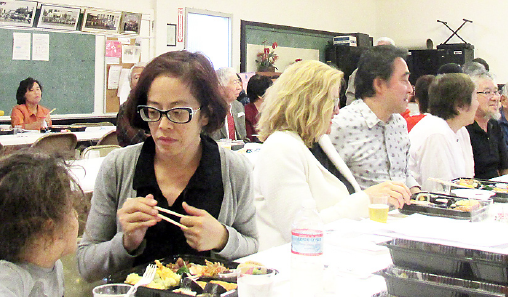 Attendees enjoyed a delicious bento with servings of sashimi and homemade oden prepared by longtime member Sadayuki Yamato and resident caretaker Keiko Sandoval. 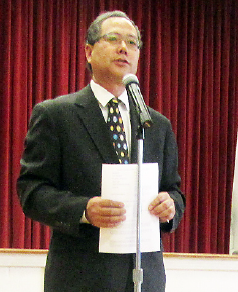 Entertainment included karaoke and a humorous magic show and harmonica performance by special guest and president of the Valley Japanese Community Center, Ken Kageyama. HJCI’s annual fundraising raffle capped off the evening with cash prizes, gift certificates, and other prizes donated by members, affiliate groups, and local business supporters. The HJCI celebrated its 100th anniversary in October 2015. For more information about the HJCI, its affiliate groups and upcoming events, visit www.hollywoodjci.org, email [email protected], or call (310) 413-6220. Guests enjoy a delicious bento lunch.